In Paris in 1985, a first event was held to celebrate the meeting of two disciplinary fields, entitled “Mesure pour mesure, architecture et philosophie”. Architects and philosophers were invited to discuss together how philosophy could capture better what determines architecture itself. But what still remains today of the cross-over practices when it is about trans-, re-, co-, alter-architectures or bio-, geo-, eco-sophy? How do these successive re-definitions put these practices into question? What are the events which already have oriented, re-oriented and sometimes dis-oriented their narratives, speeches and fundamentals? What still and always resists and transforms itself? The present book is the gathering of a large variety of approaches in order to discuss what is taking part to the joining and the opening of a world. 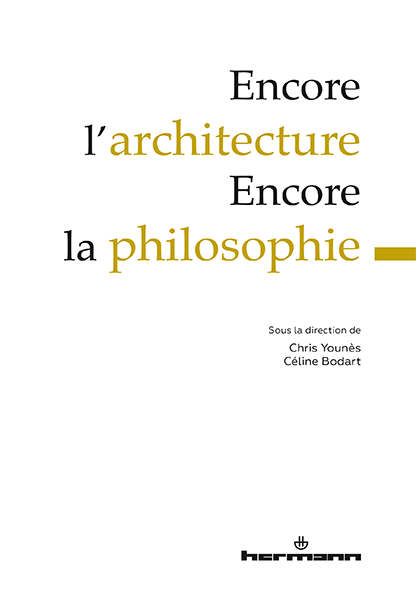 This publication follows the international conference, entitled Encore l’architecture – Encore la philosophie (Paris, March 2015) ; an initiative of the GERPHAU lab, research group for Philosophy, Architecture, Urban (Architecture School of Paris La Villette, UMR 7218 CNRS-Lavue), in partnership with Cité de l’Architecture et du Patrimoine and philAU (a scientific thematic network : Philosophy, Architecture, Urban). This conference was also the first international conference supported by ARENA. With the contributions of Aurosa ALISON, Guy AMSELLEM, Manola ANTONIOLI, Giorgia AQUILAR, Manuel BELLO-MARCANO, Céline BODART, Xavier BONNAUD, Stéphane BONZANI, Léonor CHABASON, Cécile CHANVILLARD, Pierre CLOQUETTE, Alice FINICHIU, Murray FRASER, Benoît GOETZ, François GUÉRY, Pauline LEFEBVRE, Jean-Pierre MARCHAND, David MARCILLON, Luca MERLINI, Pasquale MIANO, Daniel PAYOT, Renaud PLEITINX, Richard SCOFFIER, Jean STILLEMANS, Pieter VERSTEEGH, Chuan WANG, Chris YOUNÈS. Guy Amsellem, « Ouvrir une rencontre ‘Architecture et Philosophie’, trente ans après Jacques Derrida ». Chris Younès, « Encore ». François Guéry, « Amnésies: l’architecture ». Benoît Goetz, « Struction, écume, épars ». Daniel Payot, « Agencement et narration (on n’est pas des anges) ». Céline Bodart, « Intro-duction et inter-duction: les règles du jeu ». Pieter Versteegh, « Daidalos et derrigaray; encore co-construire ». Aurosa Alison, « Reconstruction et co-construction de l’ « oikos » contemporain dans la philosophie de l’espace de Gaston Bachelard ». Xavier Bonnaud, « L’architecture à l’ère de l’Anthropocène ». LAA, « Philosophie et architecture: contrariétés trans-disciplinaires et opportunités inter-disciplinaires ». Alice Finichiu, « R comme résistance ». Manuel Bello-Marcano, « La niche biosémiotique ou l’avénement animal des mondes humains ». Pasquale Miano & Giorgia Aquilar, « Towards a disciplinary reconstruction of architecture ». Luca Merlini, « Le milieu du monde, l’île et le XIQ (ou l’archipel des mots) ». Manola Antonioli & Léonor Chabason, « Nisso-architecture ». Jean-Pierre Marchand, « L’édifice comme hétérotope ». Richard Scoffier, « Passages ». Chris Younès, « Nouvelles rencontres entre architecture et philosophie: résonances, écarts et interfécondités ».